Our Diwali Door Hanging workshops let little ones use paper and glitter to create take-home banners to welcome the Goddess of Fortune into their homes. Children will love transforming everything glittery, shiny and bright into attractive designs ready to send out to friends and family. It’s the ideal way for your centre to be the go-to spot for all of the community to connect and come together. A necklace of fresh flowers is the customary go-to item for Diwali celebrators. Our special workshop let’s children recreate this tradition transforming paper cutouts into their special flower garlands. Little hands can get stuck into this simple craft workshop. Our team are on-hand to show everyone how to use bright colours and different textured papers to create light-reflecting mobiles to take home; ideal for hanging in the entrance of windows during the Festival of Lights! The Dreidel is one of the most traditional activities of Hanukkah. Children and adults alike will love coming together to take turns to spin the dreidel piece. Any number of players can get involved for the chance to win prizes including sweets, chocolate, in-store prizes and special treats. This is an excellent way for retailers to donate prizes and get involved with those celebrating Hanukkah and the wider shopper audience alike. Children will love our dreidel making workshops. With the help of our specialist team, they’ll enjoy modelling the spinning dreidel from craft clay and painting them to match. Wow shoppers with a delicious challah bread demo. Watch footfall increase rapidly with the smell of the bread being made before their eyes. Not to mention the opportunity for everyone to taste it at the end of the demo. Candles are the traditional symbol at this Jewish Festival of Light. Our origami experts are on-hand for everyone to have a go at folding bright and sparkling papers into their very own take-home paper candle and holder. Every shopper enjoys the opportunity to win-big. 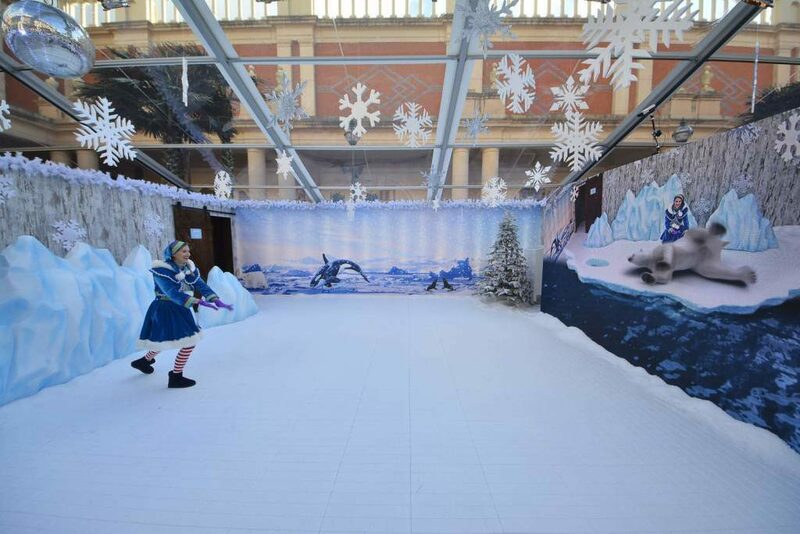 Our specialist production team are ready to deliver game-show style activations albeit with a wintery twist. Any creative vision is possible as we transform your centre with big game-show boards, surround-sound, lit-up screens, snowy ball ponds and all the fun of a live television game-show. In the season of giving, what better way to invite every shopper to create their own personal mark than with our custom-gifting workshops. Kids and grown-ups alike will love choosing from a wide variety of bold papers, creating their own patterns with stamps and sparkling ribbons for the finishing touch. This year, why not invite all shoppers to escape into an alternative festive world with the help of some fairytale friends. Alice in Wonderland, Beatrix Potter, the Mr Men series and plenty more are just some of the colourful characters to take inspiration from this year. Partnering with our sister company, Vibration Design & Production, we can imagine, design and custom build sets, grottos and props to be used year upon-year. We’ve created bespoke scenes for hundreds of retailers across the country. The stats prove that when your Christmas activation offers something different from the usual traditions, you’ll become talked about as the go-to Christmas destination for shoppers by many miles. Why not chat to one of our team to see how we can brainstorm a truly unique festive theme, designed to attract everyone? This October, it’s time to dust off the cobwebs from outmoded rituals and upgrade your Halloween fun. We’ve got a whole host of tricks and certainly a lot of treats guaranteed to pull in audiences and make you stand-out this spooky season. So how can you revamp(ire)? Let children’s imaginations reign free with our bewitching potion making workshops. This hands-on activity allows kids to pick out their favourite recipe before mixing up the ingredients to match. With everything from creepy crawlies to glitter, the hocus-pocus experience allows for weird and wonderful creativity. Bottling up and labelling their potions, kids are left with a present to take home and families enjoy the creation of one-of-a-kind memories. Slime is one of those go-to favourites of children everywhere. Can there be a more fitting time for them to get their hands on the slippery stuff than at Halloween? They’ll be queues down the aisles for our workshops, enabling kids to customise their own slime. Their perfect Halloween mix? Well that could be anything from pumpkin seeds, spiders, eyeballs or glitter. When they’ve finished, our team are on-hand to help them tub-up their creation, write spook-tacular labels and add gruesome stickers. How to create the most ghoulish of pumpkins minus the mess? This year, leave the chaotic carving behind and enjoy sticky-free fun. Our Pumpkin Pimpin workshop sees children get stuck in with all things sparkly, goggle-eyed and colourful, ready to take home a new-found friend. Will they be scary or pretty? The choice is theirs. Sweet treats are more devilishly delicious when they’ve been created yourself. Little ones and bigger kids alike will delight in the chance to upgrade their usual tricks and treats in our range of tasty workshops. Our enchanting team are on-hand teaching them all the magic needed to transform cookies into vampire teeth, chocolate into freaky spiders and marshmallows into vibrant cobweb dusters. Liven up the darkness of Halloween by taking inspiration from Mexico’s vibrant Day of the Dead festivities. Rich, bold decorations hint at a time for festival colours to parade in full array. Our team will help everyone get in the mood with everything from sugar-skull decoration, paper crafts and garland making. Want to make your Halloween celebrations truly haunting? Our selection of spine-chilling entertainment goes hand-in-hand with our experiential workshops. Fancy a former Cirque Du Soleil Witch Doctor to bring bombastic fun to your activation? Or how about our charismatic snake-handler to draw shoppers in with her amphibian friends? With a long roster of exclusive acts to choose from, why not give our team a call to discuss a bespoke plan that will enchant audiences way beyond your Halloween event? This season, there’s a sure-fire way to see shoppers hot-foot it to your centre: by letting them get a first-look at the top trends to step off the catwalk. We’ve done all the legwork, working with our in-house stylist to identify the key looks consumers are sure to love. What’s more, through strategic investigation, we’ve dug-deep into the stats. 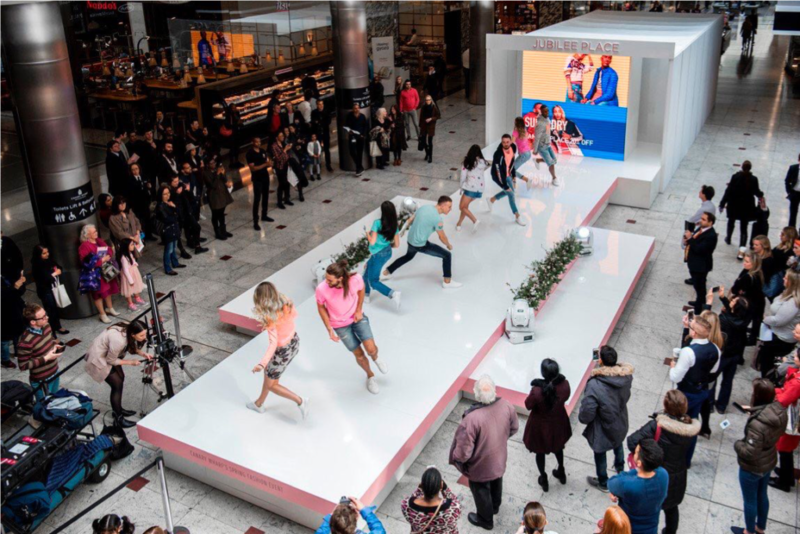 Our findings reveal that clients enjoy a significant uplift in footfall, dwell time and average spend during and after one of our catwalk-shows. We’ve rounded up key ideas for shoppers to get trend-savvy and connect with retailers. This season, the trends are on fire with an interesting mix of colours and patterns. We’re all about those rich burgundy tones, paired up with Autumnal block colours. Animal prints remain top of the charts as the go-to look particularly when partnered with earthy brown. The Queen’s Balmoral look will beckon fashionistas as they channel heritage-chic picks including re-invented tweed and printed silk scarves. With our experienced event producers, stylist, dancers, models, choreographers and audio-visual technicians all on-hand, our catwalk shows never fail to leave audiences wanting more. The best bit? Shoppers take-away lasting connections with retailers and know where to shop to stay ahead of the trends. The show needn’t stop at the catwalk. Customers love experiencing the glamour and excitement of fashion first-hand. What better way to immerse them in this chic world than with their own bespoke makeover. Our make-up artists are some of the industry’s best and can show customers everything from how to favour flawless smoky eyes to how to get that perfect pout plumper. It’s great for make-up retailers to be involved in Autumn/Winter activations, increasing footfall and spend within their stores. What’s more, customers leave feeling inspired by industry-level make-up knowledge and ready to return again and again when they want a fresh new look. Not everyone can rock head-to-toe leopard-print. But every shopper can channel the latest trends with some clever accessorising. We’re here to help everyone get on top of the best new looks; our accessorising workshops are just the trick. We’ll design and install an imaginative set to display top accessory choices. Our stylist will then explain how they can work with every-day fashion followed by a Q&A session for shoppers to gain personalised fashion advice, hints and tips. Can there be anything more glam than casting your eyes over the catwalk with a glass of prosecco and yummy cupcake in-hand? Incentivise shoppers to make a seasonal wardrobe makeover by rewarding them with a glass of bubbly and a sweet treat. We’ll install a chic looking bar, custom-dress it to match the look of the catwalk and have our friendly team on hand, offering lucky shoppers some TLC after a hard-day of hitting the shops. Now that’s the way to get Autumn/Winter-ready! If you’re looking to really inspire shoppers this Autumn/Winter, why not speak to one of our team to see how we can custom-create the ideal event strategy for you? Sand, sea and sustainability. This Summer shoppers will be out in force, looking for holiday-ready ranges and ways to occupy little ones. Yet there’s something greater emerging on our Summer agenda: Sustainable living. With hard environmental headlines hitting everyone, consumers have shifted focus from buying more to buying better. So how can retailers be at the center of 2018’s eco-efforts whilst attracting shoppers to enjoy precious family time? We’ve been working with green herbal pioneers to curate special-edition workshops. Inspiring guests to connect with nature and learn about everyday garden herbs, our workshops enable all ages to create mini-terrariums. Guests leave with all the knowledge needed to keep up their indoor gardens- great for shoppers without outdoor planting space. Every family-member can be involved; a memorable way for parents to cement precious bonds with kids. What’s more, everyone gets to enjoy a take-home terrarium memento of their time. Retailers find their reputation rapidly growing as the top place for quality family time to sprout! Heard of the expression ‘beauty is in the eye of the beholder’? Well this 2018, this phrase could never be truer. All around us, we’re immune to seeing throwaway goods. Perhaps it’s time to think of our trash as treasures. We’ve launched an array of activities designed to re-cycle and up-cycle the items we waste. The result? Unique crafts consumers can take home. Ever thought about how a plastic milk bottle looks like an elephant? Maybe not. But with clever decoration, handles turn into trunks and friendly faces emerge- much to the delight of little ones. With many more up-cycling activations on our agenda, now’s the time to captivate audiences with imaginative eco-crafts. Britain’s bees are in trouble! 35 UK bee species are under threat of extinction. This is where retailers can help! Our unique Bee B&B activations offer all the family the chance to be heroes that help nature. Children become hands-on crafters of hives using bamboo sticks. Painting and decorating them with bright colours, their creations become bee-attractive homes. A resident expert is on-hand to explain to little ones the importance of their efforts meaning kids know they’ve helped the plight of their much-loved stripy friends, creating B&Bs that encourage pollen creation. With kids bonding with parents, siblings and friends, it’s an ideal way for everyone to feel the Summer buzz! To gain inspiration from our team on how to activate your Summer sustainability strategy, contact us at info@xcitecm.com or 020 8531 5869. We know the score. Everyone’s sitting watching digital screens and family-interaction is at an all-time low. Yet emerging technology has an incredible capacity to connect people together. Which Is why we’ve dreamt up a powerful way to re-direct consumer-use of their smartphones. What’s more our solution not only cements long-lasting ties between people but it also connects people to retailers. How? We’ve created a range of tech-driven games. Consumers simply have to download our specially designed app and they’re sent on a treasure-trail across your retail space. Their on-screen virtual world maps out your shopping space as consumers enjoy real-world interaction with the brands they love and the brands they’re about to love. Along the way, shoppers solve clues and puzzles, stopping off at our specially-designed activity hives strategically placed in specific retail spots. Friends and family alike can opt to compete with one another or just play on their own, ensuring that everyone can be included in the fun. What’s more, we’ll customise your game-app with your own bespoke branding and can even integrate it with your centre’s own app. With your centre coming alive in digital form, our custom app games are the perfect way to engage consumers now and well into the future. To check out the virtual world we can integrate with your reality, speak to one of our team on info@xcitecm.com or call 020 8531 5869. Students love a freebie. Yet for retailers, giving away free branded items is the perfect way to encourage the student rush. What’s more, goodies that are printed with your brand name and slogan are a simple way of creating long-lasting ties with your target audience. Once students have your branded item in hand, their affiliation with your brand increases and they’re more likely to have positive memories of what the brand means within their world. At Xcite we’ve dreamt up an array of creative branded items. Working with everyone from Rushden Lakes to the Victoria Centre to London’s East Village, we’ve worked up merchandise including balloons, cupcakes, ice cream tubs, bags and artwork. We create bespoke ideas for every retail centre so that your Student Night can be one-of-a-kind. What better way to create an immersive night of fun than with stand-out entertainment? We’ve hand-picked top talent that are sure to offer students an evening to remember. With acts including roaming stilt walkers, DJs, caricaturists, live bands and face painters, students can shop, chill and feel those festival vibes. Work and play are all part of the student lifestyle. So how can retailers become the go-to destination for students wanting down-time? By being central to student ‘play-time’. With our ‘Grab-it’ activation, students are immersed in their very own gameshow, pressing a big gold button to see what prizes they can potentially win. Entering a ball-pit, students will have 10 seconds to collect 5 golden balls to win the big prize. Complete with our audio-visual extravanganza, this is an excellent way to build hype, create social-media ready moments as students gain exclusive offers, discounts, prizes and in-store gift-cards. To chat to our team and discover how we can help you create a student night to be remembered, contact us on info@xcitecm.com or call 020 8531 5869. Shifting family models mean everyone now enjoys the fun. School Holidays. A precious moment for families and one of the busiest times in the retail calendar. Endless days-to-fill mean the pressure is on retailers to keep little-ones entertained and parents stress-free. Yet a new-wave of thinking has arrived. Let’s have a look at the full story. Once upon-a-time, retail centers were a trusted beacon for kid’s holiday entertainment. Harassed parents could stock up on new wardrobe staples for trips away, safe in the knowledge that their kids were kept-busy with child-friendly activities. Today dynamics have changed. Longer working-hours mean family-time is rare. More-and-more consumers choose to shop-online. Families don’t want time off to be spent in silo. Which is where retailers can help. By paving the way for the whole family to connect, brands build legacies. They’re known as the go-to place for families to enjoy meaningful moments. Whole-family activations mean shopping centers become central hubs. People choose to spend time in them, not by necessity but to make those vital bonds. The ideal way to include everyone? Tech-driven family games. At Xcite we’ve harnessed the power of digital to conceive activities designed for all. Customising our bespoke-app with retail centers’ own branding or integrating the center’s own app, we deliver treasure-hunt games with a virtual twist. Visitors work together to solve clues and puzzles on a smart-phone based treasure-hunt around the center. Stopping off at our activity hubs and finding treasures in retail spots, everyone has the opportunity to be involved. Consumers discover shopping finds they previously may never have found. Parents watch little-ones bonding. And ultimately retail-centers are placed top of the agenda as the go-to place to experience holiday fun. To take a look at how we can help your brand or center becomes top of families’ agendas, why not contact our team? Catching a look at the catwalk for new-season styles. Summer is showing its first hints. Yet a long-lasting Winter means consumers search for escape. This Spring/Summer, they need look no further than our bright catwalks. Connecting consumers to the looks they’re soon-to-love is vital for securing loyalty as they hunt for new wardrobe staples. So how better to stay on their style-radar than with live, entertaining catwalk shows? This season we designed, installed, produced and styled runway shows across the country. Our long-standing collaboration with Canary Wharf sees us produce over 20 shows over a 3-day period, four times a year. This Spring we created a Millennial dream. Our bespoke stage design came complete with hints of Millennial pink and florals accenting the sides. Sending 12 models down the catwalk, our vivid audio-visuals brought the show alive. Our talented stylist JP was on-hand to curate the chicest looks from across the participating retailers. The winning trends? Bold block colours, mismatched florals and of course, shades of Millennial Pink! At the Centre MK, our custom-designed stage is built as a cross, mirroring the centre’s own shape. Installing the set, our carefully placed lighting and sound systems allow visitors to walk around the stage for a 360-degree experience. Over 2 days we produce every element of our 11 catwalk shows, liaising with retailers to inspire shoppers. JP compered the show, enlightening audiences on fashion tips to stay-ahead. This Spring/Summer a panel discussion with local bloggers and influencers left consumers brimming with style-tips. 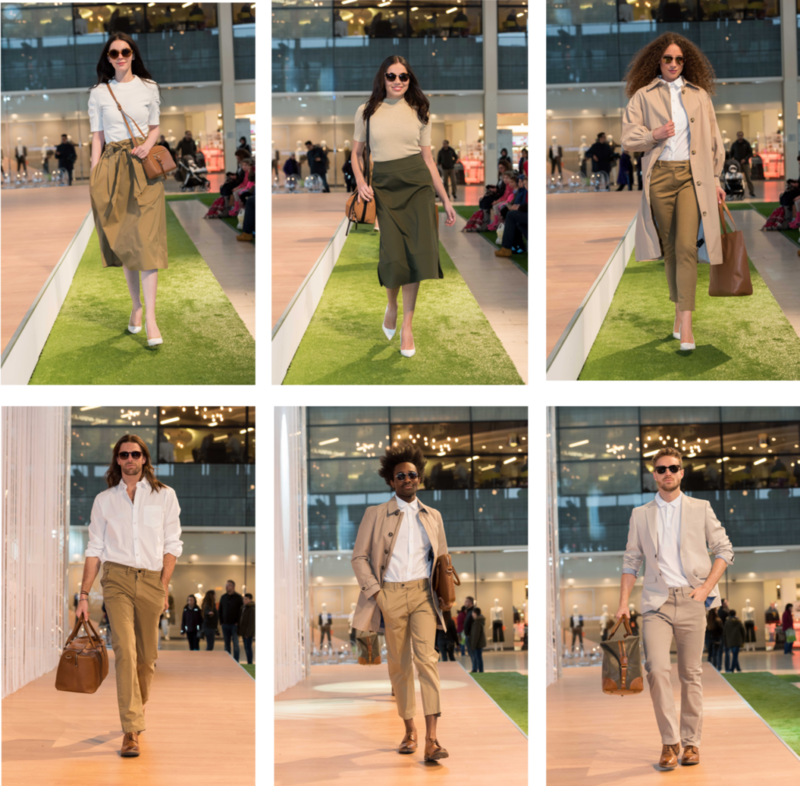 Our Love Fashion weekend at Basingstoke’s Festival Place, ignited 2 days of stylish fun. A rainbow-hued flower wall complimented stylist JP’s floral-chic runway looks. 6 models danced to a backdrop screen displaying the relevant brand names. Perfect for consumers wanting to source their favourite finds. A fashion-forward installation greeted shoppers at Lakeside. Inspired by styles that spread between girl-group friends, our ‘Squad Goals’ display included tiers of mirrored staging. Female mannequins stood as a bright collective in the best block patterns of Spring/Summer. Seasonal changes call consumers to keep ahead of the trends. A catwalk-weekend of inspirational shows is an ideal way to increase footfall, elevate brand-affinity, increase coverage on social media and make those long-lasting consumer ties. Christmas. A pinnacle in purchasing power. Last year, Britain’s retailers collectively took over £50bn during the Festive period. Yet this is a season of soaring competition. The fight to secure consumer-loyalty intensifies and the pressure to cement a place on shoppers’ ‘must-go’ check-lists heightens. So how to become a much-loved festive destination, year-upon-year? Placemaking logic follows that spaces become sought-after destinations when people not only use them but want to use them. How? By strategically investing in inspiring facilities. So why should this rationale work any differently during Jolly Season? Truth is, these placemaking principles are most true at Christmas. Bored of seeing tired-looking Christmas novelties, shoppers crave fresh inspiration. It’s why we’ve helped our clients invest in Christmas the right way. Collaborating with everyone from the Trafford Centre to Centre MK to British Land, we’ve delivered installations that sit in shoppers’ minds and build a festive legacy for years to come. Augmented reality and Christmas may not be a traditional mix. Yet doing Christmas differently is the sure-fire way to stay top of shopper’s festive agenda. At Manchester’s Trafford Centre, a virtual life awaited little ones. 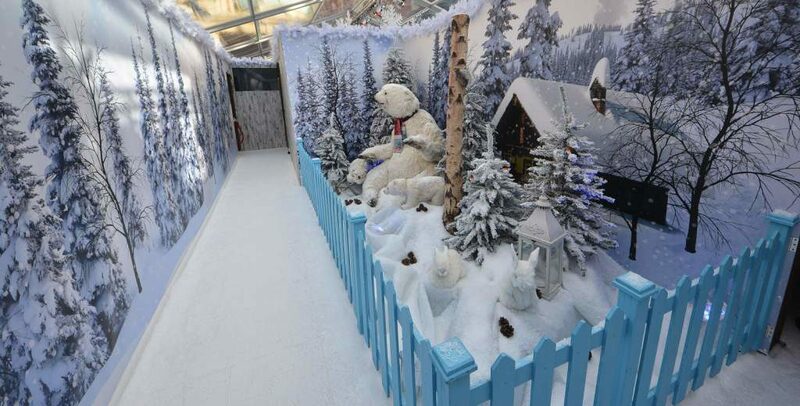 Our grotto-with-a-twist attracted around 16,000 children who travelled from across the region to enter Santa’s parallel world. Following story-time with elves, children enjoyed a 20ft screen, displaying an Arctic augmented reality. Digital scenes showed polar bears, seals, fish and Eskimos. Finally, the fantastical became reality and children met a real-life Santa. Where is the least-expected place to see Santa? 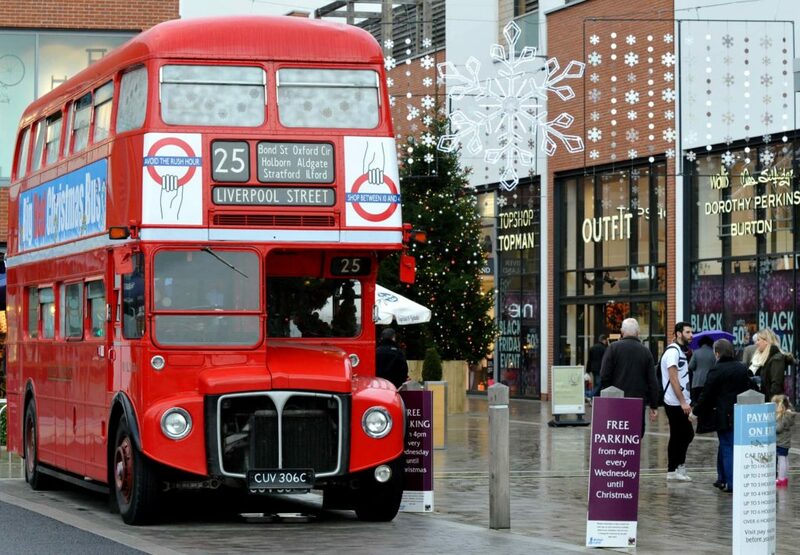 Perhaps an iconic Routemaster bus? Collaborating with British Land, we produced, delivered and staffed a travelling double-decker, enabling 2346 children to experience Santa’s magic, across 7 UK sites. All the family were invited to board the bus, create a postcard to Santa with glitter, stickers and of course the all-important wish-list. Sourcing seasonal food and drink vendors, guests tucked into delicious treats whilst waiting upon their experience. Upstairs, we transformed the bus into Santa’s grotto; an enchanting ending to the festive journey. 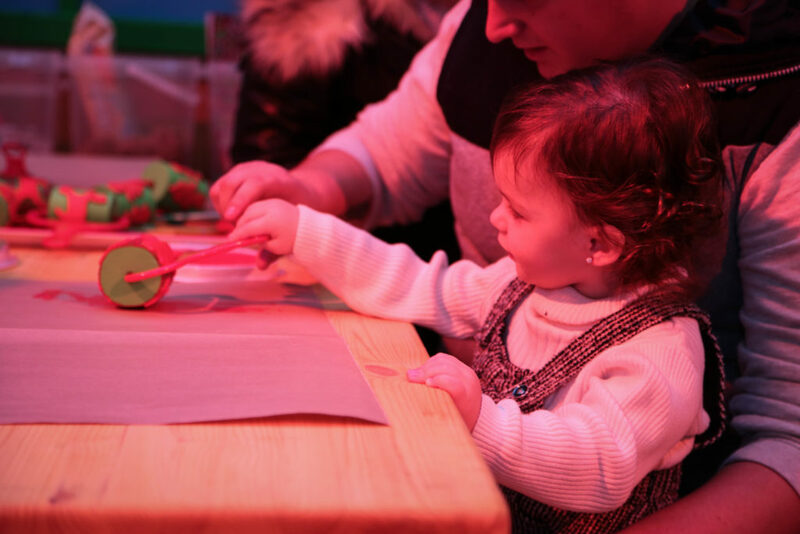 A hands-on experience of Santa’s world creates vital ties between families and retailers. So, inviting little-ones to make friends with his elves in a very special workshop at Centre MK, kids had the opportunity to make their own reindeer food. 17,000 children journeyed to our bespoke grotto installation for the chance to live the life of an elf and finally meet Santa himself. The best thing about our installations? Families look forward to experiencing their special memories all over again in following years and clients have a lasting festive investment. Now that’s the way to make festive magic! Think Easter and think bright yellow chicks announcing Spring’s arrival, fluffy rabbits overflowing with pastel-coloured eggs, and endless chocolate chow-downs? Pretty patterned eggs aren’t only laid by Spring-time chickens. This year, valiant adventurers can forgo the usual Easter narrative and enter into a fairytale universe. Here, dragons rule the roost as visitors of all ages set off on a quest to hunt for legendary dragon eggs. Why not enable guests to don a pair of metallic wings and have their faces painted in glittering-dragon designs? After transforming into mythical creatures, little ones and adults embark on their mythological voyage, cracking clues and meeting fantastical characters along the way. Guests’ adventurous spirits are finally rewarded with a chocolate surprise, hidden inside their treasured glistening egg. Further delight is found in decorating dragon-eggs at a glitter and jewell-filled embellishment station. Similarly live entertainers provide some much needed time-out from carrying Easter purchases, as they tell fabled stories of dragons-past. Dragon-Quest is certainly an ideal way to see your Easter activations garner legendary status! What happens at Easter on the other side of the Earth? Why not let shoppers escape to the Southern Hemisphere this Spring and discover the answers as they enjoy Easter in Oz? With Spring already showing glimpses of sun, its time to let the glow-factor go full-blast with an Easter weekend of fun, sun and kangaroos. Follow Skippy and his friends in a special Outback trail past bespoke installations, discovering brightly coloured eggs hidden inside retailers and around the centre. Those with keen eyes are hand-delivered chocolatey prizes straight from the pouches of some very friendly kangaroos. Easter-bonnet making gets an Australian twist as children decorate hats with embellishments including mini kangaroos and felt Aussie creatures. Intrepid Outback explorers enjoy further fun through face-painting, Easter kangaroo tales from story-time entertainers and egg-decorating workshops where little ones can craft take-home kangaroo-faced eggs. As robots evolve at lightning speed, everyone wants a glimpse of what the future may bring. This Easter its time to partner with new robot friends and take a look at the Easter of the future. Time-travel around the centre and discover a new-world where silver and marbled eggs contain QR codes ready to reveal chocolatey prizes after they’ve been digitally scanned. Audio and visual projections guide shoppers in a series of interactive displays showing the Easter Bunny’s digital counterpart, BunnyBot. Shoppers can see and hear BunnyBot animated in neon-hued projections, helping them with clues to take them to the next stage of their futuristic adventure. Little ones can join craft workshops learning to paint and decorate their own mini-robot eggs to take home. More futuristic fun is found through live robot entertainers handing out chocolate alien-eggs brought back from far-away lands. Craft-lovers can join bespoke bonnet decorating workshops, adorning themselves with metallic, glittering robot-themed headwear. This is truly the ideal way to skyrocket an unforgettable experience of the Easter of tomorrow. Easter is retail marketing’s ultimate sugar-rush. In 2017, the Easter break saw the sugar-rush spike as clothing, shoes, homeware and food sales were at their highest in over a year. Last April, Britain’s consumers were out in force, helping to push the pound to its most powerful peak in eight months. Spring is seemingly the perfect time to boost footfall and uplift sales. What’s more, retailers shouldn’t limit their efforts to just children. Whatever their age, consumers crave experiences that say something unique to them. As the Wellness Market explodes, its clear that shoppers connect with retailers that mirror their health and happiness goals. We’ve rounded up our top activations to put a spring in shoppers steps. No Easter Bunny required! Sweet-treat season never loses its appeal. Yet sticky-chocolate faces are child’s play. Google Trends shows that people hunting for vegan Easter Eggs has near-tripled since 2015. Whilst consumers clearly desire healthier options, few retailers centre Easter activations around foodie alternatives. So this Spring it’s time to stay ahead of the competition. 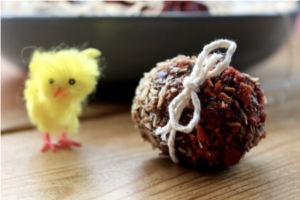 Why not delight customers with an Easter-themed vegan bliss-ball workshop? These superfood energy-balls can be easily made by shoppers. With workshops lead by our specialist makes-and-bakes team, everyone gets a take-home treat and memories that last way beyond Easter. Mixing up ingredients including raw cacao, cashews, almonds, coconut, dates and goji berries, these bliss-ball Easter ‘eggs’ are sure to treat everyone to the season’s positive energy. Spring brings a fresh-feeling of the great-outdoors. No longer needing to cosy-up by the fire, lighter days and newly-grown florals incentivise consumers to become in touch with nature. In full ‘spring-clean’ mode, shoppers want to bring botanicals inside, refreshing and reviving their environments. 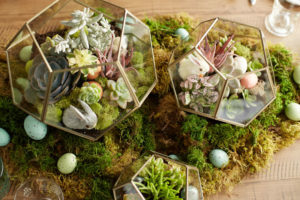 As they hit retail centres in search of homeware inspiration, what better way to create stand-out experiences than with a bespoke terrarium-making workshop? This fun and surprisingly easy activity, requires just a few basic materials. 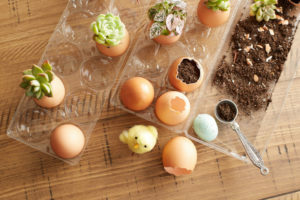 As shoppers learn how to create their own miniature worlds, this unique workshop is a simple way to grow consumers’ excitement for the fresh-season. With huge flexibility, the workshop can range from creating full-scale centrepieces to mini-egg keepsakes. The season’s blue skies and glimpses of sun see consumers wanting to refresh body and mind in time for Summer. The Easter break enables shoppers time to relax and unwind as they seek to freshen up their lifestyles. Working in partnership with top yoga and meditation instructors, bespoke classes are a perfect way to mirror consumer-needs. The offer of complimentary sessions is a sure-fire way to magnetise shoppers into centres whilst heightening dwell-time. What’s more, these custom-created workshops are an ideal way to flag Spring-season sportswear and athleisure collections. 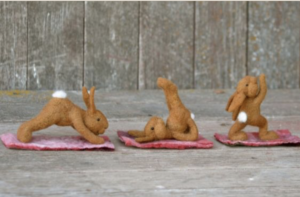 These inclusive sessions work around consumers so that everyone from first-timers to accomplished yoga bunnies will enjoy positive Easter vibes. Imagine the future. What image springs to mind? A combination of Hollywood invention and utopian Sci-Fi leads us to far-away worlds where floating cars, robotic friends and ethereal travel are all par for the course. Yet look around you. This seemingly fictitious world with its accelerated pace, clean lines and seamless design elements, is suddenly looking not so far-away. Okay, so we may not own floating cars, don’t regard robots as our closest friends and time-travel remains rooted in Hollywood fiction. Yet as technology advances, there’s one major trend threading together consumer behaviour: MINIMALISM. Whilst arguably the post-internet age brings complexity, it equally offers an ability to reduce the clutter we carry. All our contacts, our knowledge, our notes, our payment cards, our entertainment, our memories and our comforts are integrated into something the size of our palms. No longer do we lug around bags filled with a messy abundance of possessions. We’re good to go whenever. Wherever. We’re set to experience the world, unencumbered by ‘stuff’. A recent report produced by research consultancy Kantar highlights how consumerism is changing fundamentally. Characterised as a ‘Live Large-Carry Little’ ethos, the report underlines that consumers favour rich, meaningful experiences, free from excessive material goods. So, what does this mean for the Retail Industry? Is this preference for experiences above possessions, an obvious kick in the teeth? In short, no. Far from it. Brands, retailers and shopping centres are actually in the prime position to predict, innovate and lead consumer’s ‘Live-Large’ ethos. Twenty years ago, Joseph Pine and James Gilmore penned the now legendary book ‘The Experience Economy’. In it, they predicted a brave new world where businesses would conceive a sphere of experiential touchpoints in order to resonate and be valued by consumers. Today, this observation is an absolute imperative. The most innovatory and astute brands and retailers have refocused their businesses proposition. No longer are they just institutions offering products and services, they are the makers of cultural experiences. They capture the zeitgeist and design everything they do with an experiential dimension. Brands with longevity know that they need to have presentism in all aspects of consumer’s daily experiences. Through retail environments, pop-up activations, immersive platforms and in-store communications, they realise brand worlds, not just brand guidelines. At Xcite, our founding impulse is to help retailers produce immersive worlds that really mean something to consumers. In a ‘Live Large-Carry Little’ era, we’ve never been prouder of this impulse than today. In the barrage of messages bombarding consumers, the largest task marketers face is staying relevant. Mastering long-lasting consumer connections is crucial. Yet in 2018 there’s no one-fit solution. How can you stay ahead of audiences’ interests, desires and habits before they even know them themselves? Our Secret Little Weapon: Xcite’s Event Marketing Calendar. In today’s Experience Economy, identifying the moments that matter most to your customers couldn’t be more vital. Consumers ascribe value to the brands and destinations that provide them with vivid, memorable experiences. Companies that successfully maintain first-class customer relationships must dig deep to provide exciting touchpoints that mirror audiences’ interests in original, refreshing ways. Name-checking the usual parade of Valentines, Easter, Halloween and Christmas is not enough to make audiences tick all year-long. A lot of forecasting magic is needed to keep consumers on-board. Luckily our in-depth, free download is here to help you carve crucial campaigns and compelling occasions throughout the year. In Xcite’s three-part series, we look at the trends disrupting the event industry of tomorrow. Our Insights team reflect on how consumers will turn from Passive Observers to Loyal Brand Advocates. Consumer-first, personalised activations have a much broader reach than purely brand-centric events. By making experiences that marry audience interests with a brand’s identity, we optimise the scope of their appeal. Yet best-in-class initiatives reveal carving a well-loved destination is much more than highlighting the facilities on site. The real art comes from creating the ideal atmosphere. The way to ignite that atmosphere? People. The age-old expression that ‘people make a place’ couldn’t reign truer in 2018. The more a destination signals its inclusivity, the more people it will attract. Diverse audiences enable spaces to become destinations known for their vibrancy and creativity. This energy has a magnetic effect attracting more visitors and securing a destination’s success. At Xcite our creative process begins with the interests of audiences. We know their needs, desires and interests before they even know them themselves. It’s how we conceive varied activations personalised to differing audiences so that everyone can feel they have their own unique connection with a place. Shoppers, locals, tourists, city-workers, and families must equally feel included in a space if it is to remain centered on the map and remembered as a vibrant, must-visit place. As tension and division become central topics in parliament and the media, 2018 will see quality destinations have a real power to pull people together. At Xcite, we pride ourselves on our ability to conceive events, occasions and long-term experiential strategies that pave the way for everyone to enjoy the benefits of development. It’s how our Placemaking initiatives in 2018 will ensure the spaces we work with remain at the top of people’s minds as game-changing destinations. Innovative brands and destinations know their marketing campaign must reach beyond online content. In a hyper-competitive Experience Economy, consumers are digitally-empowered and can choose to ignore and switch off from irrelevant ads and content. Brands must be a stepping stone for audiences to experience the things that matter most to them. Audiences don’t want to be talked at; they want to be talked to. Making memorable moments that resonate with audiences in real-time can make consumers feel long-term connection with brands. However, marketers have previously produced experiences where brands’ aims and identities are prioritised above listening to audiences. The result? A forgettable experience with low-impact on consumer behavior. In 2018 this approach just won’t cut it. With ceaseless distractions heading the way of consumers, there’s only one way to seize their attention. Personalisation. Experiential activations offer brands and destinations the opportunity to frame the customer journey, alter purchase behavior and grow brand affinity. In 2018, these outcomes will only be achieved by activations carved around robust consumer insights. At Xcite, we combine creative vision designed to delight and entertain, a heightened understanding of audience biases and leading technologies. Our years of experience delving into consumer needs means we have unparalleled knowledge of the key issues affecting their decisions. We’ll be triggering ever-more personalised messages for consumers, building bespoke augmented realities, integrating AI into our live experiences and redefining every touchpoint into unique consumer-first moments in 2018. As technology develops and consumers expect ever-more, we’ll continue to transform the shopper’s state of mind from passive observation to active affinity. 2017 has been an epic year for brands and destinations wanting to create authentic, long-lasting connections with their audiences. Their secret? Strengthening consumer relationships through real-time brand touchpoints. By crafting moments that deliver value to audiences in real life, significant emotional ties and enduring brand-loyalty are ignited. In 2018 our always-on culture will escalate. A relentless avalanche of web ads and digital noise will increasingly hit consumers as daily life becomes defined by online activity. This may lead brands to be perceived through irritation, confusion and negativity. More than ever, brands must ideate strategic ways to make themselves stand out. They must position themselves as original, relatable and well loved. How? By driving an experience culture. This means integrating consumers in highly engaging, memorable activations. Experiences that they want to be a part of and can’t wait to show to their network on social. This 87% of business leaders agree that customer experience is vital for success (Harvard Business Review 2017). Those with a forward outlook know that to get ahead, their marketing plans must rouse and connect with consumers personally. Research shows that businesses placing experiential activations at the top of their strategic agenda enjoy engaged online communities, active, involved offline communities and more dominant market positions and stronger revenue growth. The Xcite team always build sharable social moments, extending the excitement for those who were there and generating FOMO amongst those who missed out (and hope to be there next time). It’s how we bring everyone closer to the event virtually. We know the importance of creating truly awe-inspiring moments. As the Experience Economy thrives further in 2018, our expert team will continue helping brands and destinations reverberate in people’s minds.